On Saturday 6th July 2019 The Absurdist Pipe Band will be playing in Tarbert, Argyll as part of their annual seafood festival. Come along for some of our usual musical shenanigans and some fishy delights. We’ll be around from 11am. 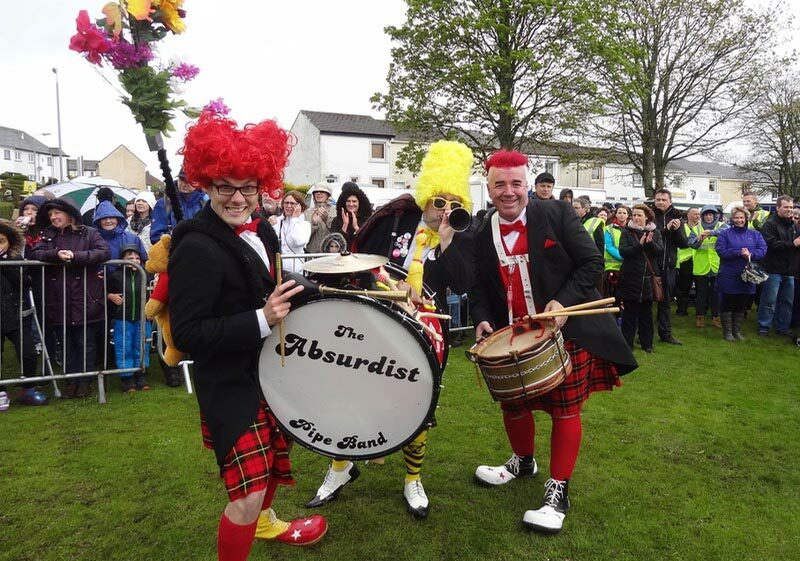 The Absurdist Pipe Band will be playing at the Ballina Salmon Festival on Sunday 15th July 2017. The Absurdist Pipe Band will be playing at the Ballina Salmon Festival on Saturday 14th July 2017. The Absurdist Pipe Band are delighted to have been invited back to the world famous Rose of Tralee International Festival on Friday 19th, Saturday 20th and Sunday 21st August 2015. The Rose of Tralee International Festival is one of Ireland’s largest and longest running festivals, celebrating 57 years in 2015. The heart of the festival is the selection of the Rose of Tralee which brings young women of Irish descent from around the world to County Kerry, Ireland for a global celebration of Irish culture. 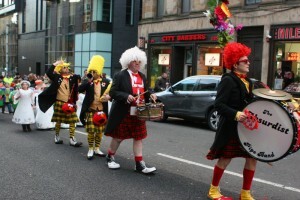 The festival also includes street entertainment, carnival, live concerts, theatre, circus, markets, funfair, fireworks and Rose Parades. The Absurdist Pipe Band are delighted to have been invited back to the world famous Rose of Tralee International Festival on 18th, 19th and 20th of August 2017. The Rose of Tralee International Festival is one of Ireland’s largest and longest running festivals, celebrating 56 years in 2015. The heart of the festival is the selection of the Rose of Tralee which brings young women of Irish descent from around the world to County Kerry, Ireland for a global celebration of Irish culture. 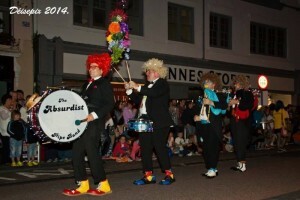 The festival also includes street entertainment, carnival, live concerts, theatre, circus, markets, funfair, fireworks and Rose Parades.